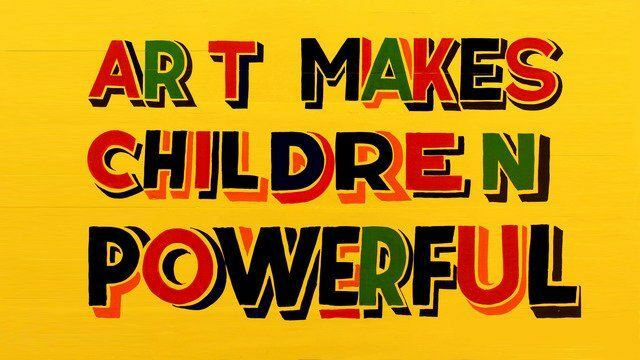 British contemporary artist Bob and Roberta Smith (b. 1963, London), one artist despite the dual identity - aka Patrick Brill, is famous for his political, often humorous and empowering artworks. Smith graduated with an MFA from Goldsmith College, London, in 1993 and shortly thereafter chose his pseudonym, which references his sister Roberta with whom he collaborated creatively in the early years. Smith works with different media including collage, installation and performance, but he is mostly famous for his sign paintings that involve comic yet thoughtful and politically provocative texts. The artist self professed his interest in the idea of 'green-ink letters', (an English expression referring to supposed letters expressing eccentric views, sometimes considered inspired by paranoia or hallucination), and he explores the notion of short anonymous tongue-in-cheek sentences that he paints on wood, cardboard, canvas and various other materials. His writings explore the relationship between art, politics, society and humour in order to constantly question the viewer's approach to everyday things. Most importantly, however, Smith attempts to empower the spectator. Surrounding his signature pieces that feature his own or quoted fragments of various text is a large body of work that allows anyone to participate: a temporary art school teaching tonality and expression, an opportunity to dress up as Hannah Arendt - a great influence on Smith’s thinking - an invitation to copy, paste and resend his open letter to the British education secretary Michael Gove. Bob and Roberta Smith have had numerous solo exhibitions at prestigious institutions including at the Hayward Gallery, London; the Whitechapel Gallery, London; Pierogi, New York; and Galleria Carbone.to, Torino. Selected group shows include Tate Britain, London; Hayward Gallery, London; Serpentine Gallery, London; Tate Liverpool, Liverpool; CCAC, San Francisco; National Gallery, Copenhagen; and CIMA Gallery, Calcutta. Smith's work can be found in public and private collections including the Tate Collection, UK Arts Council Collection and UK British Council Collection. In 2009, a sculpture by Bob and Roberta Smith was shortlisted for the Fourth Plinth exhibition in London’s Trafalgar Square; in 2008, Bob and Roberta Smith’s Christmas Tree was exhibited in the hall of Tate Britain, London. Bob and Roberta Smith lives and works in London. I have forgotten, was there a past?